HydroChat is a new feature for the HCRN blog. This is an opportunity to share with our readers papers from academic journals and to discuss the implications for those whose lives are impacted by hydrocephalus. This post features the recent HCRN publication by Dr. Jay Wellons, Shunting outcomes in posthemorrhagic hydrocephalus: results of a Hydrocephalus Clinical Research Network prospective cohort study. You can read the full article by clicking on the title. Why is this paper important? Babies who are born very prematurely sometimes have bleeding into their fluid filled spaces in the brain (ventricles). This is called intraventricular hemorrhage of prematurity (pIVH). 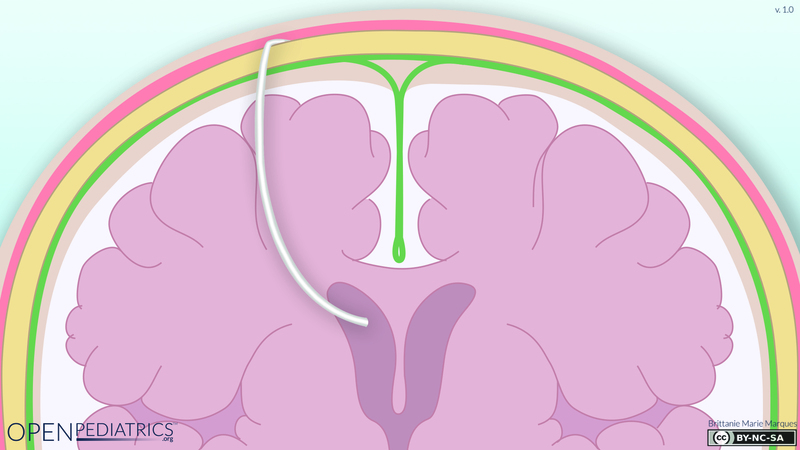 If this hemorrhage is severe, it can plug up the cerebrospinal fluid so that it builds up in the ventricles (this is one of the causes of hydrocephalus, and is a focus of our research network). 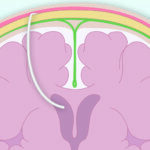 The fluid needs to be drained or it can start to affect the brain tissue. In older children the most common treatment for hydrocephalus is a shunt but these premature babies are too small for a shunt. They have to be temporarily treated another way with a “temporizing procedure”. There are several different ones, but the two most commonly used are ventriculosubgaleal shunts (VSGS for short) and ventricular reservoirs (VR). 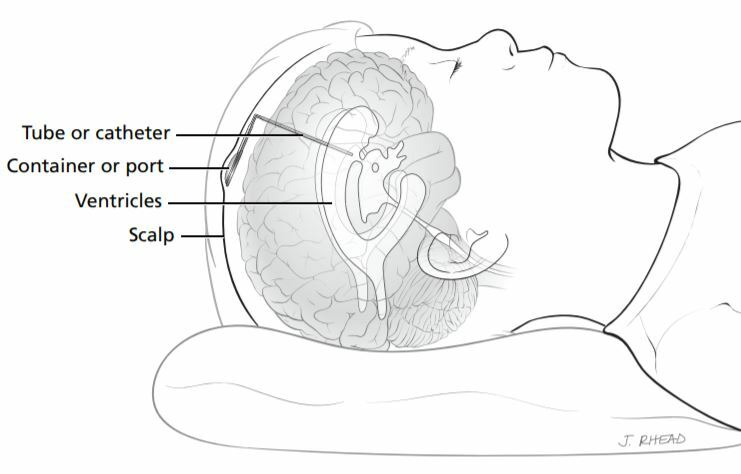 A VSGS is a tube that goes from the ventricles, where cerebrospinal fluid is made and circulated, to an area under the skin where it can be reabsorbed. A VR is a tube that goes from the ventricles to the outside of the head that the doctor can pull fluid from periodically to try to reduce the excess fluid. 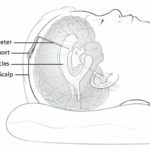 Sometimes these temporary treatments work well enough that the child’s hydrocephalus is improved and they never have to receive a permanent shunt. This is a good thing because having a permanent medical device in your head comes with a number of risks and challenges. The authors of this paper wanted to know if one of these procedures (VSGS or VR) is better. In a previous study on this topic they found tremendous variability from one hospital to another in the decision making for these procedures, making it hard to decide which one was better. So, they developed guidelines for surgeons in the study to use to decide if an infant with pIVH needs to just be observed, should get a temporizing procedure, or should get a permanent shunt. They also made sure that the temporizing procedures were done in the same way at different hospitals. Once the hospitals were standardized with respect to temporizing procedures, there was no difference between VSGS and VR for whether an infant would later have to get a permanent shunt. 1) Ventriculosugaleal shunts (VGSG) and ventricular reservoirs (VR) are both good options for temporizing procedures in premature infants who have hydrocephalus caused by IVH. If one or the other had been better at keeping an infant from eventually needing a permanent shunt, then doctors would be encouraged to use just that procedure. For now though, doctors can continue to use either one, knowing that one is not worse for their patients. 2) Standardizing across hospitals is important for multi-center studies! One of the strengths of research networks like the HCRN is that we don’t just learn about patients from one hospital or area in the country. We can learn about a bigger population of children with hydrocephalus, which lets us develop better treatments for all of them. If the different hospitals are consistent in how they do surgeries and decide to treat patients, then it’s easier to compare different treatments to each other.